My enjoyment for crocheting and knitting was instilled at a young age by my grandmother. She taught me the basics and sent me on my way to master my craft. I became quite proficient in the making of granny square hats, scarves and purses. With the birth of my first daughter, I decided that I wanted to crochet her a sweater. I found the perfect color yarn with just the right texture and went to work. The sweater came out perfect and rekindled my love for the craft. The sweater gets a lot of compliments. 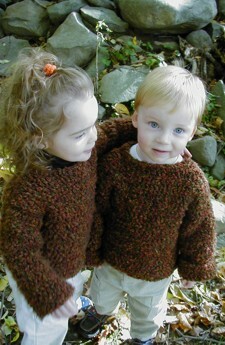 That said, I'm offering these 100% handmade sweaters for you to share with the little ones in your lives. In addition, I've also created a couple of optional accessories such as a matching hat & headband, which complete the set.